Awnings are a great addition to any outdoor living space. They can also be used for protection from the weather on windows and doors, say goodbye to the days of searching for your keys in the rain. Awnings can be used for a variety of household needs but which ones work best for you can help you decide what to purchase. A patio or deck can become a functional space on a hot day when the sun is beaming down or even during a summer shower. An awning can also protect the patio from the elements and preserve years of extra use. On a larger space retractable awnings are the way to go. These roll out when in use and roll back up when not in use. You can either have a manual on where you slide it out yourself or you could let electricity do it for you. There is also the top of everyone list, automatic awnings, this can sense when the sun is out and roll out just in time to shade you from harmful rays. These awnings are stationary awnings, meaning they do no roll back up like a retractable one. These are meant to keep doors and windows free of rain and even help with sunlight. Awnings can lower you summer air conditioning usage by deflecting light from beating into the window. 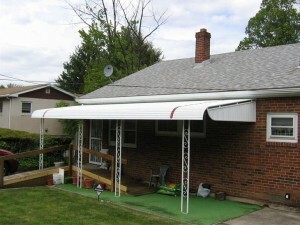 The door way awnings can keep you protected from the elements while you gather you mail and unlock your door to get it. The awnings are also a deterrent for potation criminals. It is more difficult to enter windows and leave with stolen items when the awning is covering part of the escape route. If you have any questions about what awning would be the best for your home, contact JM Finley LLC today! It’s easy to understand. I am so happy to read this. Thanks for sharing this very helpful information! Great tips! Your blog will help me a lot. Thanks for the useful post. This is the perfect blog for anyone who wants to buy awnings.